All Gnaoua Festival photography and reports by Alice Mutasa. Every year in June the tranquil fishing port of Essaouira, on Morocco’s Atlantic coast bursts into a frenzy of music and colour, when the town hosts the annual ‘Festival Gnaoua et Musiques du Monde d’Essaouira’. Previously quiet dusty streets, shady squares and sunny roof terraces become home to thousands of music-hungry young Moroccans, music aficionados from Europe, (last year’s festival saw over 500,000 attendees) and some of the finest musicians from Morocco and around the globe. Essaouira, (also known as Mogador / City of Wind) has long flourished as a Mecca for artists and musicians, and its location on Morocco’s west coast has lent it a unique ethnic, spiritual and cultural diversity. 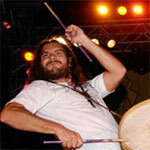 The Festival began 11 years ago, primarily as a celebration of the ‘Gnaoua’ musical heritage and tradition *. 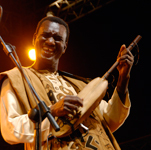 Whilst Gnaoua (or Gnawa) is firmly rooted in Essaouira, its origins lie in West Africa, and the music of the slaves who were brought through Essaouira three centuries ago. 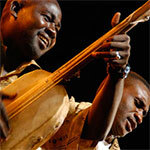 Several of the Gnaoua ‘Maalems’ or Masters playing at this years Festival are directly descended from African slaves. 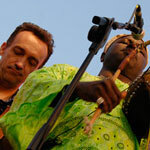 It is therefore fitting that over the years the festival has evolved into a celebration of world music, and of the connections and historical lineage between the Gnaoua tradition; music from other parts of Africa, and jazz & other western musical traditions. The Festival organisers are rightly proud of the unique space they have created for this ‘musical dialogue’ between musicians from seemingly very different cultures. 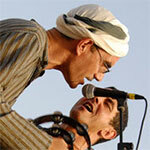 Many of the performances are improvised fusion jam sessions with Gnaoua Maalems playing alongside invited artists from Europe and the USA. 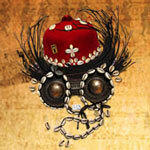 For example at this years festival, the likes of Jaleel Shaw, Andy Narell and Frank Vaillant. In the words of the Festival organisers ‘A3’, the Festival Gnaoua et Musiques du Monde is a Festival which celebrates music ‘qui a pour premier instrument le coeur’ (whose main instrument is the heart). *Gnaoua is a musical ritual of deliverance for the body and the mind, combining elements of black African culture and Islam. A key element is the ‘Lila’, or rite of possession. During this ritual, spirits are invoked and followers abandon themselves to dance until they eventually fall into a trance. Some elements of the Lila ceremony are included every night during the Essaouira festival from 12.00 midnight, often lasting until dawn.